Here begins the preview of the northeast quarter of Venatia. This map introduces a new geographic region – the Sturmdrang Mountains. The Forest of Dread lies on the western periphery, and the Golden Coast and Golden Sea take up most of what is left. The Sturmdang Range is connected to the westernmost portion of the Great Yamas. The Sturmdrangs are lush mountains and very ancient. 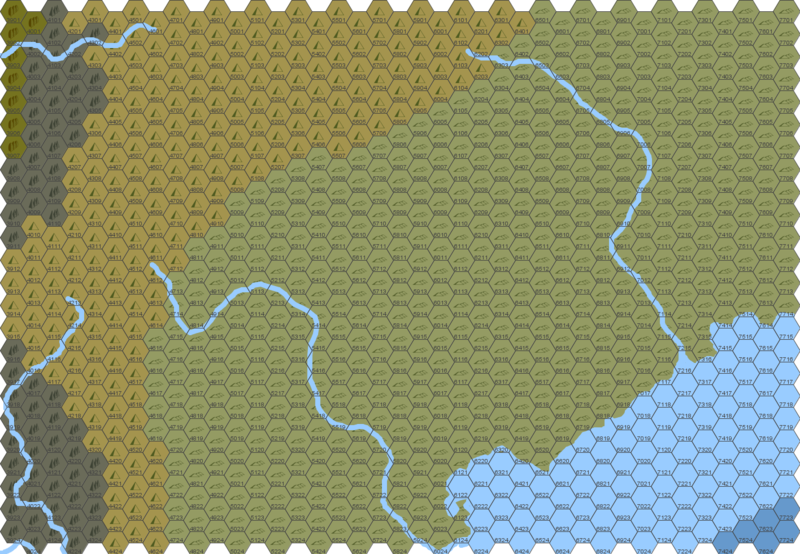 A host of rivers originate in their snowbound peaks, with the Rhodon River merging with the River Dan and flowing into the Tepid Sea, and the others (Dinar, Scorda and Oeagrus) emptying into the Golden Sea. The slopes of the Sturmdrangs are covered with coniferous forests, and the valleys are choked with broadleaf forests. The mountains are rich with flora and fauna, including brilliant red poppies, edelweiss, wild thyme, bilberry, black bears, wolves, foxes, martens, wild goats, badgers, lynx, eagles and bats. The most conspicuous inhabitants of the Sturmdrangs, and the reason for their name, are the storm giants. NOD, unlike a world founded on immutable scientific laws, does not have natural processes per se’. The natural progress of seasons, the patterns of wind, rainfall, etc are all the labors of the fey folk and other agents of the Old Gods, including their ancient, defeated foes, the giants. Weather, of course, was the purview of the storm giants, and every region of NOD has a storm giant (or family of storm giants) assigned to govern wind and rain. The storm lord of Venatia made his home in the Sturmdrangs, where he still accepts offerings and sends forth life giving rains and death dealing bolts of lightning..